Valued for their easy care and profuse floral displays, spireas (Spiraea spp.) can be used as specimen plants, hedges, foundation plantings and borders. Depending on the species, shrubs range from 2 to 3 feet tall and about as wide to about 10 feet tall and 10 to 20 feet wide. Spring-blooming, white-flowered spireas are generally called bridal wreath spireas. Arching branches bear abundant flowers before the leaves emerge. 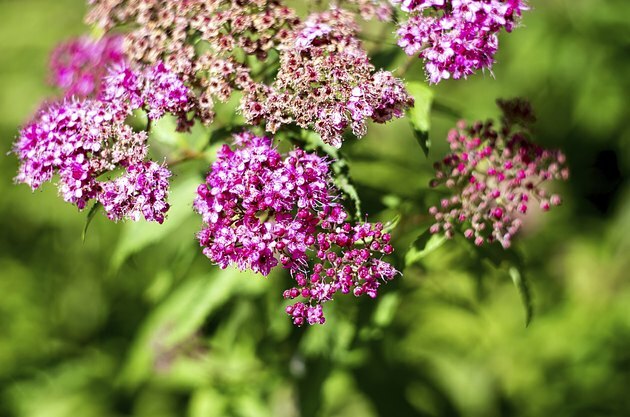 Summer-blooming spireas feature red, pink, purple or white clusters of flowers held above the foliage. Pruning depends, in part, on what kind of spirea requires a trim. For a tidy appearance, remove faded flowers of Japanese spirea. Pruning tools should be sharp and clean. Pruning shears usually work best on spirea stems. You may need a heavier lopper for removing stout branches from near the base of the shrub. Before beginning work, clean the blades with a cloth soaked in rubbing alcohol to prevent disease spread. If you prune more than one shrub, clean the shears between shrubs as well, and clean them before storing the shears. Spring-blooming spirea varieties include baby's breath spirea (Spiraea thunbergii), hardy in U.S. Department of Agriculture zones 4 through 8; Vanhoutte spirea (Spiraea vanhouttei), which grows in USDA zones 3 through 8; and Reeves' spirea (Spiraea cantoniensis), appropriate for USDA zones 5 through 9. These spireas bloom on last season's growth, so prune them right after they bloom. Choose the oldest canes and remove them back to the base, which thins and opens up the shrub. Spireas are not suited for shearing, where all branches are uniformly trimmed to the same height or into topiary-type shapes. Blooming in midsummer on current season's growth, Japanese spirea (Spiraea japonica) grows in USDA zones 3 through 8. Many varieties exist, some with colorful leaves. To ensure plentiful new growth and flowers, cut these spireas back in early spring, removing as much as one-half of the old growth. Take cuts back to outward-pointing buds to preventing the shrub's center from becoming crowded. When flowers finish blooming, remove them to encourage possible rebloom. If spireas become too overgrown and woody, try a drastic technique called rejuvenation pruning. In spring-blooming spireas, cut the whole bush back to ground level in late winter. You'll lose a year's bloom period. The following summer, cut out about half of the new canes and shorten some of the remaining canes. Summer-blooming spireas generally respond well to severe rejuvenation pruning in spring when the buds are swelling. Should I Cut Back Daylilies?